South Korean celebrity couple, Tiger JK (서정권) and Yoon Mi Rae (윤미래) both made an appearance at 'House of Artisan'event held at Gucci flagship store in Cheongdam-dong, South Korea on August 30, 2013. 'Touch Love' singer, Yoon Mi Rae (윤미래) opted for a plaid halter dress from Gucci Pre Fall 2013 collection. Completing her look with a waist belt and booties from the label's Fall/Winter 2013 collection. 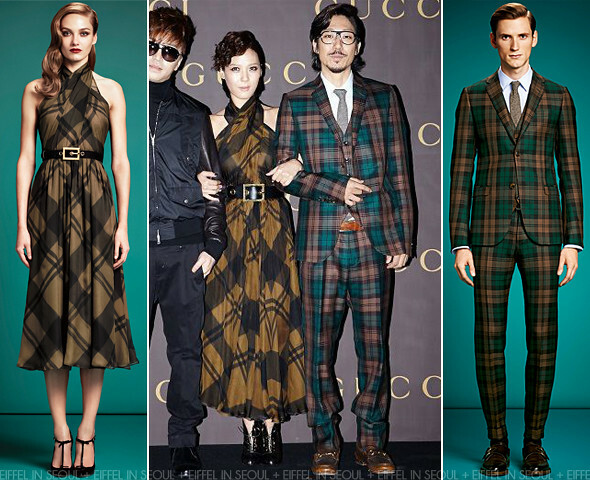 Rapper, Tiger JK (서정권) was dressed in a plaid suit from Pre Fall 2013 to match his wife. Unfortunately there wasn't much 'styling' to his look since it's exactly the same as it is in the lookbook but what a cute couple!